Gibson Dunn selects only the most highly qualified recruits and then, with guidance and training from the firm, you serve as the principal architect designing the course for your career. We believe that if you are given the power of choice and to pursue your passion, you will naturally maximize your performance and potential. This philosophy not only allows Gibson Dunn to create the winning team, but also a happy team. Gibson Dunn believes that diversity among lawyers is essential to our continued success as one of the preeminent law firms in the world. In an increasingly global world, we understand that it is crucial that we incorporate diverse competencies, experiences and viewpoints into our workforce. We are proud of our diverse partnership and look forward to developing a new and diverse generation of lawyers who will continue the long tradition of quality and excellence for which Gibson Dunn is known. For more information on Diversity Recruiting, please click here. Gibson Dunn’s ability to recruit the top talent is crucial to its continued success. Our summer program is the primary method through which new lawyers become a part of our firm. We continually attract the most intelligent, creative and personable legal talent in the world to participate in our Summer Program. How to Apply: Candidates interested in working at Gibson Dunn can directly contact a local office recruiting coordinator or see the Campus Calendar below. Please send a cover letter/e-mail, resume and law school transcript to the appropriate contact. Gibson Dunn’s summer program consistently ranks at the top of The American Lawyer‘s annual “Summer Associate Survey.” Designed to facilitate a smooth transition from law school to legal practice, the program provides substantive training in areas such as legal writing, depositions and corporate transactions. Our summer associates are actively involved in client representations, maximizing their exposure to a variety of practical aspects of lawyering. Summer associates are also encouraged to and frequently participate in a wide range of pro bono matters. E​ach summer, we hire more than 100 of the most accomplished and ambitious students from top law schools across the United States. We immediately involve them in the highest profile legal matters in the world that the firm works on every day. We provide practical training in the skills and techniques required to make top-notch lawyers, as well as the opportunity to get to know Gibson Dunn, its lawyers and its staff. Gibson Dunn summer associates have the opportunity to work on a variety of litigation projects at the trial and appellate levels, as well as corporate transactions of all types, including financings, mergers and acquisitions, and initial public offerings. In addition to sophisticated and interesting client work, the summer program includes many great social activities. This gives summer associates the chance to get to know each other and firm lawyers, and to enjoy various attractions of the cities where they are working. Each year various Gibson Dunn offices invite a small number of highly qualified first-year students to join the firm’s summer program. The first-year summer associates receive the same compensation and treatment as our second-year law students in the program. Please visit our website between November and February to learn how to apply for the 1L program. Gibson Dunn also participates in the 1L Leadership Council on Legal Diversity Scholars Program, and sends several of our summer associates each June to LCLD’s Scholars Retreat. This annual program covers a wide range of topics focused on mentoring and enhancing summer associates’ law school success and legal careers. Gibson Dunn is proud of its diversity recruiting success and looks forward to continuing to hire talented lawyers from diverse backgrounds. For more information on the program, please contact one of our recruiting coordinators and look for postings at your law school. We also invite you to read about New York corporate associate Matthew Gibbons’ experience in our 1L summer program. Matthew not only participated in the New York office’s 1L program but also returned for the entirety of his 2L summer before ultimately accepting his offer to join Gibson Dunn. As a 1L, what attracted you to Gibson Dunn and what experiences were you interested in obtaining from the 1L Diversity Summer Program? ​As a 1L, I initially thought that I wanted to be a litigator and was attracted to the firm’s robust and accomplished litigation practice. Why did you return as a 2L and ultimately decide to join Gibson Dunn? ​I returned as a 2L and chose not to split my second summer because based on my experience the prior summer and my interactions with interviewers from other firms during EIW, I knew that no other top firm would be able to offer the culture within which, and the people with whom, I knew my personality and career would flourish. What advice would you give to diverse law students looking to join Gibson Dunn? Describe what has been the best experience practicing law to date. The Gibson Dunn summer program is very dynamic and provides numerous training and relationship development opportunities to be a successful attorney and get to know the Firm. Review the calendar below to see a sample of the exciting events and training typical of our summer program. Click the calendar to view scheduled events. Blue numbers indicate days with events planned. Occasionally students will ask if there's a particular "type" of person we look for in interviews. The answer is that there is no one type - we welcome recruits and lawyers from all backgrounds who can contribute to the Firm both in our primary capacity of serving our clients and additionally in making the Firm a fun and interesting place to practice law. Select a school from the list below to see scheduled, on-campus interview dates. Gibson Dunn is delighted to offer training contracts to a selected group of exceptional students and graduates. We are looking for individuals who can take the initiative and fulfill our clients’ needs, who have strong interpersonal and organisational skills and who can rise to the challenge of working directly with partners within small, focused teams and having client contact early in their careers. You should have at least three ‘A’ levels (AAA, AAB or ABB) or equivalent, and have obtained, or expect to obtain, a 2.1 degree or better. Trainee Solicitors experience first-rate work experience with leading lawyers in their fields, together with excellent practical training, mentoring and support within a collegial, respectful and relaxed environment. We also offer a highly competitive salary and benefits package and will provide you with the tools you need to build an exceptional career. 2021 will see our seventh intake of trainees join the firm. Back in 2015, four pioneering trainees started their training contracts in the London office, qualifying in 2017. All four stayed with the firm post-qualification giving us a retention rate of 100%. All six of our 2016 intake of trainees accepted a post-qualification position with us in 2018 giving us another 100% retention rate. Our training programme goes from strength to strength with our intake numbers increasing, regular secondment opportunities available and the design and development of a structured, tailored suite of departmental workshops and seminars for trainees at the start of each seat rotation, and throughout, to complement their on-the-job learning. Why Train At Gibson Dunn? Gibson Dunn is one of the world’s leading law firms. Our lawyers work on some of the highest-profile deals and disputes involving cutting-edge legal issues often across multiple jurisdictions for a wide range of global industry leading clients. In this programme, you will be part of a group of intellectually bright, ambitious and high-achieving trainees, and get first-class, hands-on experience. Gibson Dunn trainees assume a high level of responsibility in each and every matter they work on. Trainees receive all the support they need, both informally through being part of a friendly, helpful and sociable team, and more formally through the firm’s mentoring system. As a Gibson Dunn trainee, you will work alongside some of the most talented lawyers in Europe, the U.S. and Asia. Based in London, trainees frequently work on international transactions and cases with our colleagues and clients overseas. The firm is also able to offer trainee secondments to overseas firm offices, as well as with clients. During the two-year training contract, trainees will have the opportunity to spend time in a number of different departments, including corporate, finance, dispute resolution, employment, tax and antitrust/competition. Trainees typically share an office with a partner or a senior associate and work with them on their matters, as well as with other lawyers throughout the firm. Gibson Dunn trainees also frequently work on some of the London office’s local and international pro bono activities. The firm is proud to have a strong and sustained commitment to pro bono work, and trainees are strongly encouraged to participate in this tradition. We currently expect to offer around seven training contracts for 2021. If you are interested in applying for a training contract please click here or to find out more information, contact our London Graduate Recruitment and Development Manager, Kathryn Edwards, at kedwards@gibsondunn.com or view our graduate recruitment brochure [PDF]. Note: The deadline for applications is 31 July 2019. In 2019, Gibson Dunn will host one three-week summer vacation scheme for students interested in pursuing a career with the firm. The scheme is intended for law students in their penultimate or final year of study, students of other disciplines in their final year, recent graduates (in any discipline), and those already taking a GDL or LPC course. Scheme participants have the opportunity to take part in seminars and workshops, as well as perform meaningful work on the firm’s high-profile matters. Gibson Dunn strongly encourages candidates interested in a training contract to apply for a place on our summer vacation scheme, rather than directly for a training contract. To date, over 93% of our trainees have been recruited from our previous summer vacation schemes. If you are interested in applying for a summer vacation placement please click here. The deadline for applications is 1 February 2019 but please be advised that places on our summer vacation scheme will be allocated on a rolling basis and so early application is advised. 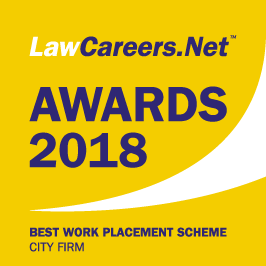 In 2018 we were awarded the “Best Work Placement Scheme – City Firm” award by LawCareers.Net. Gibson Dunn offers a General Open Day to provide an insight into life at a top international law firm. The day is packed with seminars, talks and interactive workshops, including partner panel sessions introducing you to the practice areas of the firm. It also includes an opportunity to meet our partners, associates and trainees informally over lunch and evening drinks. Applications are welcome from law students in their penultimate year of study, students of other disciplines in their final year of study, those who have already graduated (in any discipline) and those who are already studying on their GDL or LPC course. Priority will be given to those who are considering starting a training contract with the firm in September 2021. To apply, please click here. The deadline for applications is Sunday 25 November 2018. Our First Year Insight Day is packed with informative sessions to help you understand what it is like to work in a commercial law firm, including a partner panel session, a commercial awareness workshop, a Q&A with our trainees and some invaluable tips on interviews and application forms as well as how to distinguish between different law firm cultures. Applications are welcome from law students in their first year of undergraduate study and students of other disciplines in their first or second year of study. The First Year Insight Day is designed for those at the early stages of researching a legal career. To apply, please click here. The deadline for applications is Sunday 14 April 2019. Gibson Dunn’s ability to recruit top talent is crucial to its continued success. Our Munich office offers internship programs for both students who are still in law school (Praktikanten) and legal clerks (Referendare) as part of their two-year mandatory legal clerkship. Designed to facilitate a smooth transition from university to legal practice, our internship programs provide substantive training in various different areas. Our interns are actually involved in client representations, maximizing their exposure to a variety of practical aspects of lawyering. You will be immediately involved in the highest profile legal matters in the world that the firm works on every day. We provide practical training in the skills and techniques required to make top-notch lawyers, as well as the opportunity to know Gibson Dunn, its lawyers and its staff.